You are here: Home � All Deals , Electronics: Computers Video Games GPS , Featured � Microsoft-Certified Refurbished 20 GB Xbox 360 System with a 1 year warranty, 2 wireless controllers, a headset, and 3 games for $199.99. Microsoft-Certified Refurbished 20 GB Xbox 360 System with a 1 year warranty, 2 wireless controllers, a headset, and 3 games for $199.99. Buy.com is selling a Microsoft-Certified Refurbished 20 GB Xbox 360 System with a 1 year warranty, 2 wireless controllers, and 3 games for $199.99. With just as long of a warranty by Microsoft as non-refurbished units you can have piece of mind. 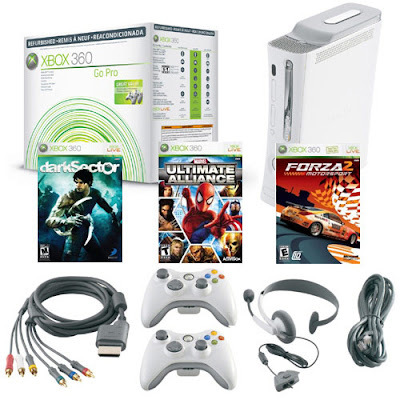 For an Xbox360 Arcade price you can get a 20 GB hard drive, an extra wireless controller, a headset, and 3 games comparably. The games in this offer are the following: darkSector, Ultimate Alliance, and Forza 2. Get more information about this offer by clicking here.